Fire | Learn about Greek Mythology,Greek gods,Greek mythology stories! The very old time in Greek mythology,the gods and goddesses of the Greek were living in palaces built at the top of the mount Olympus.Leader of the gods,- father of the gods and human- as they called him,was Zeus.He was wise and powerful.But he was also cruel and could offen show his cruelty.He used his thunderbolts when he was getting angry,so even the other gods were afraid of him.Zeus was married with Hera and they had many children. 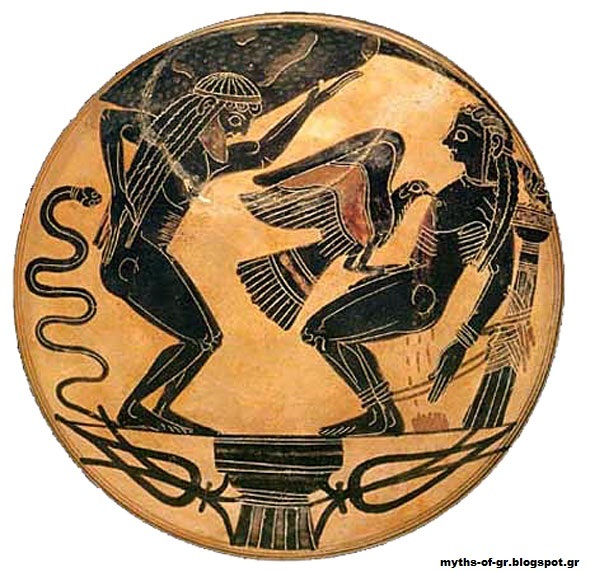 The first years the gods ruled an almost empty world ,there lived only animals and were no human beings.The animals were created by the brother of Prometheus,Epimetheus,but he didnt know how to create people. One day Zeus asked Prometheus to create human,to live in the world.So,Prometheus took some clay,gave shape to it and created the people,men and women.He made them to look like the gods and by blowing in their mouth,gave them life. People were living nicely but they didn't have fire,because Zeus didn't want to give them.But,Prometheus loved the people and was pity of them,becasue they shiverd at the cold nights,they couldnt see in the dark and they ate their food raw. So,one day he went to Olympus,sneaked into the Palace of Zeus and took a piece of lit coal.He gave that piece to the people and tought them how to light fire.Since then human learnt to cook their food,they could stay warm in the cold night and could see in the dark.People were thankful to Prometheus and never forgot his special gift he gave them. When the smell of the cooked food,reached Olympus,and the light in the night could be seen,Zeus figured out what Prometheus had done.Zeus,outraged,shouted with a voice which sounded like a thunderstrike,"How dare you do that Prometheus!Ignore my orders,be prepared for your punishment!" In order to punish Prometheus,Zeus ordered to leash him with chains to the slope of a huge mountain,Caucasus.Everyday and eagle was eating his liver and ever night his liver grew back.Prometheus was in horrible pain,but he could not die,because as a god,he was immortal.His torture lasted for many ages,until Zeus decided to forgive him and released him.